Help your child engage with mathematical concepts at home using the following activities and guide. 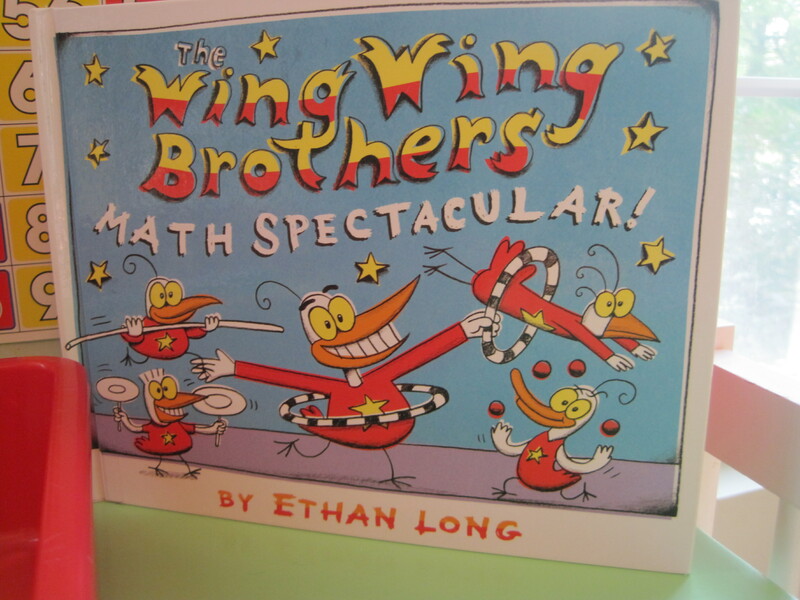 Studies show that mathematical learning is best absorbed in the early years through play, routines and daily activities, like going to the grocery store, park, or a friends home, not at a tutoring session. Toss those workbooks and read on Parents! Infants, including newborns, demonstrate simplistic recognition of basic mathematical concepts. They can perceive patterns and quantities at a limited level. For instance, infants will be more afraid of a large dog than a smaller one (quantity) or bob their head to a musical beat (pattern recognition). Around one year of age, children understand ordinality (1st, 2nd, 3rd, etc…) as well as equivalency (sets of objects can have the same value) at basic level. For instance, they learn that at meal time you must put on a bib first, receive your food second, eat third and wipe up last (ordinality) and they can appreciate that two similar trucks in a sandbox are the same size (equivalency). As an infant grows, he quickly picks up on mathematical vocabulary (number names, more than, less than, equal to, take away, add, etc…) through imitating adults. He learns that memorizing the names of the numbers that adults use is important. Number names are still abstract and have very little significance to one year old babies (beyond receiving profuse praise from adults if they say them), but once a child turns two he begins to gain a deeper understanding of quantity and learns that items can be counted. Number names are rather illogical in English and so memorizing the names of numbers in order takes practice. Children will possess a sense of ordinality and attempt to name numbers in order, although their attempts will not be prefect at first (1, 2, 3, 5, 9). They often catch themselves in a loop while counting or quickly learn that 1 comes first and 10 is last and then fill in the middle randomly with whichever numbers they can recall. Avoid telling a child that they are counting incorrectly. Instead, acknowledge their effort and say, “I hear you counting” and then model the correct way when the opportunity presents itself. A child who can name numbers does not necessarily understand what the numbers mean. A child must grasp that numbers are a symbolic representation of quantity before he can truly count. You will know that your child is really counting when he touches each item, one at a time, while saying the correct number name. Often young children who can count will forget where they started counting and recount objects. Subitizing is knowing how many objects are present by sight, without counting. Children as young as two can subitize the number of objects present in a small group. Most children ages 2 and up can subitize up to 4 objects in a group, but will begin counting verbally around age 3.5 to 4 years for groups with 5 or more objects. Ask your child, “How many?” even if you don’t think they can answer the question. (They will mentally attempt to answer the question even if they do not offer a verbal response.) Model how to count the group of objects after giving the child time to think. Eventually they will learn that when they see three apples it is the same amount of objects as three pears- three is always the same amount, regardless of the object being counted. After a child begins to visually recognize quantities and count, she begins to compute simple equations using addition and subtraction. A child as young as 3 years old can look at 3 blocks and recognize that only 2 will remain if you take one away or know that if you have 3 animals and he has 1 animal, then combined you will have 4 animals. Young children visualize or picture simple numerical operations (+ or -) in their mind that involve small numbers (usually 4 or less), but require tangible objects (like fingers) to count larger numbers. Snap cube counters are a wonderful building and math toy (available on Amazon for around $12). They help children develop creativity, mathematical understanding, spatial reasoning and logic as they create 2-D and 3-D designs and learn about counting, quantity, patterns, categorization as well as geometry. The activities, questions and suggestions included below are useful for children ages 2 to 6 (A child’s responses will greatly vary based upon his developmental phase and age). Counting cubes tell a mathematical story as they are arranged into different formations or “pictures” (as referred to in this article). Unlike adults and older children, younger children do not read or write and so they use visualizations or “pictures” to help with their computations instead of written numbers and equations. It is best to create a picture with the cubes and let the child ponder what she sees. Then, ask the child questions about the numerical picture. Avoid demonstrating how the picture “works” or directly teaching formal counting and computation skills (+, -) right away. A child who discovers how the numerical patterns fits together will achieve a deeper level of understanding of the mathematical concepts than one who is simply handed the answers. To begin, design a play center like the one below. I recommend displaying the cubes in a low-sided bin on a raised surface (ex. a table). The center invites children to sit down and explore how the chart, cubes and book relate to each other. 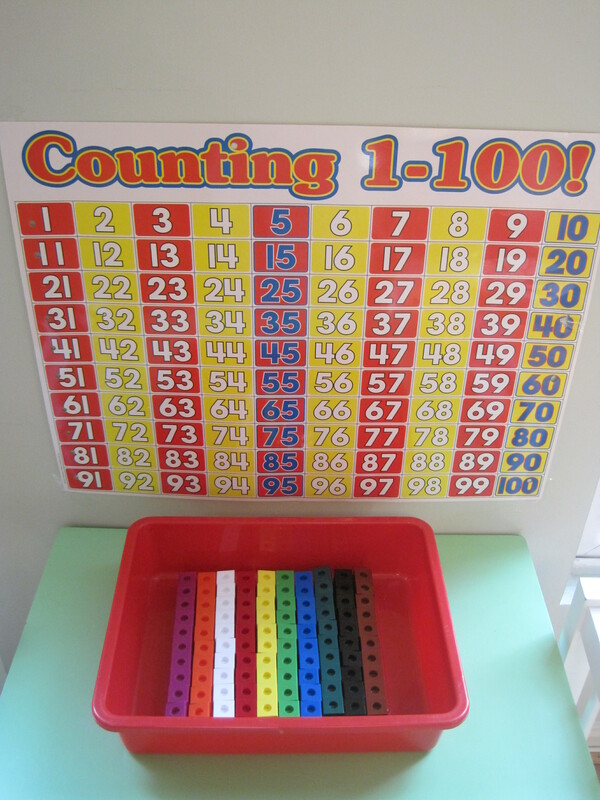 I paired my counting cubes with a number chart that displays how numbers 1 to 100 are organized and a fun, illustrated book that addresses concepts of quantity. 1) Encourage children to play independently with the cubes. Allow them to explore how they work. Most children will begin by building with the cubes. 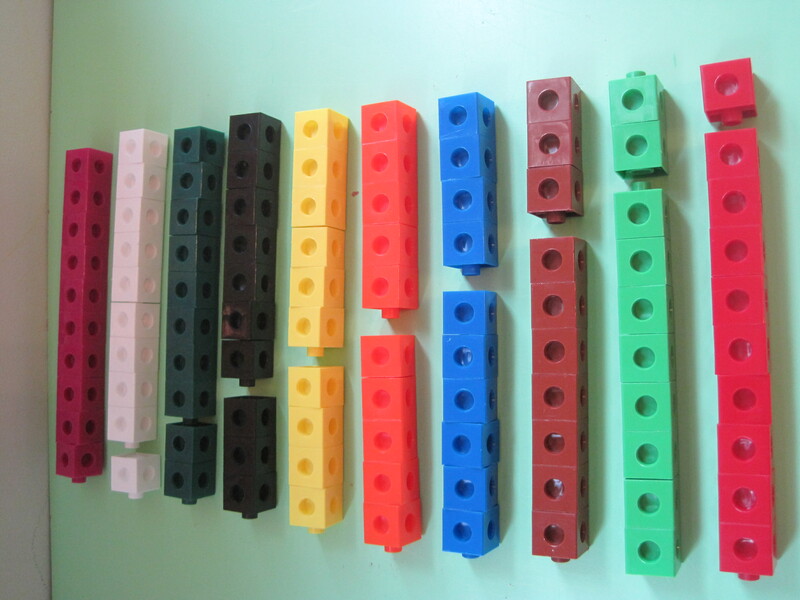 Eventually, the cubic nature of the blocks will entice them to begin counting to aid them in their construction process. 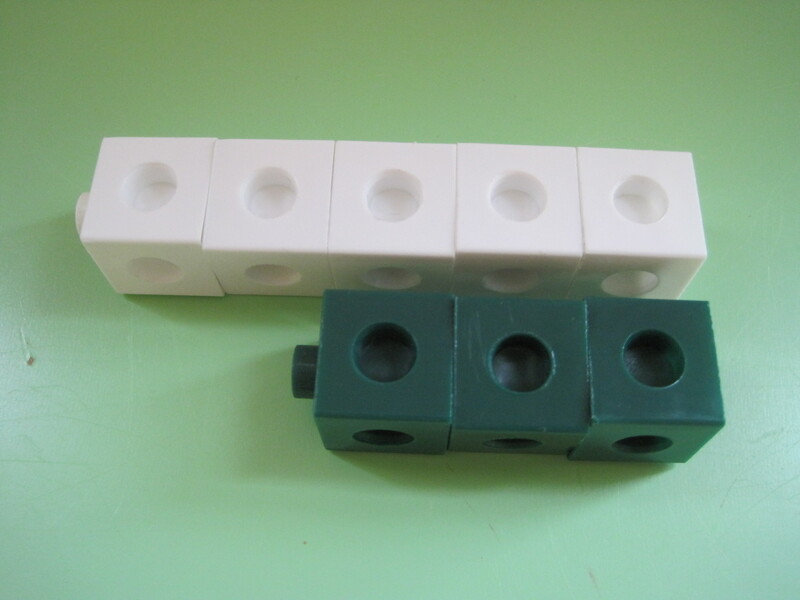 2) Ask if the child notices anything special about the block sets. Why are their different colors? Sort and name the colors. Next, create patterns together. 3) How are the cubes grouped? Does their seem to be the same amount in each group of colors? How many in each group? How many groups? Why is there 10 colors and 10 groups with 10 cubes in each group? 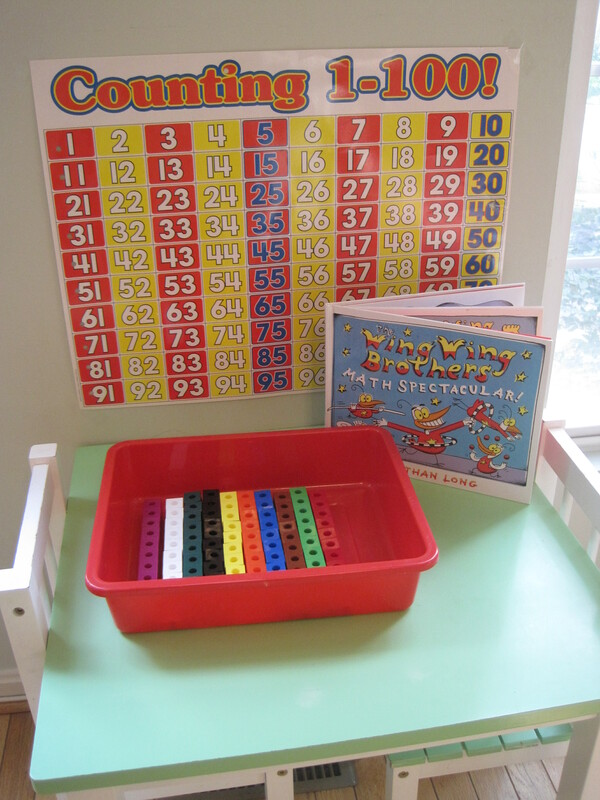 The counting activity center naturally entices a child to recognize mathematical patterns. 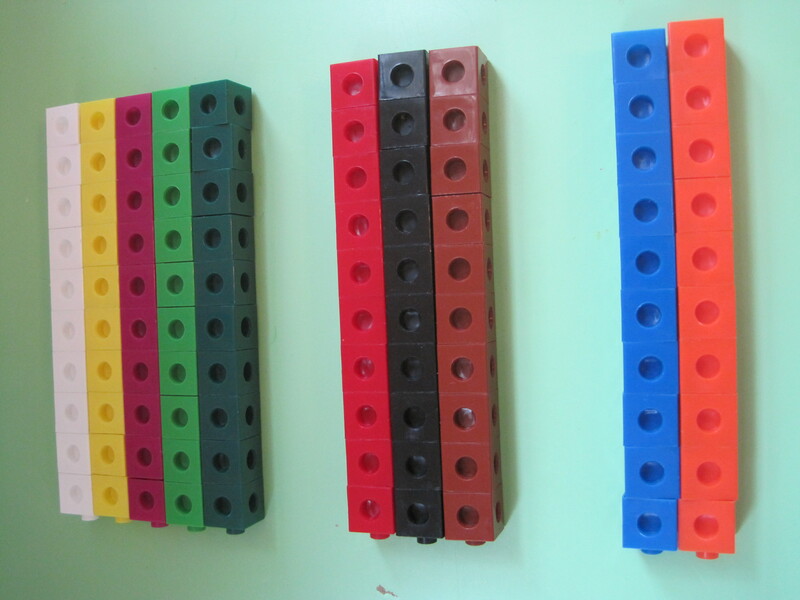 The number chart organizes the information given by the blocks into written language. The picture below compares the information given by the blocks and the written chart- they tell the same story (10 groups of 10 in rows, equaling 100). Young children will not notice this right away, but may come to notice it around age 5 after playing in the center for some time. It is important that the center be cleaned up to look like this after play as the patterns presented in this image entice the child to play again. 4) Children can separate the colors into groups and count groups in this formation. 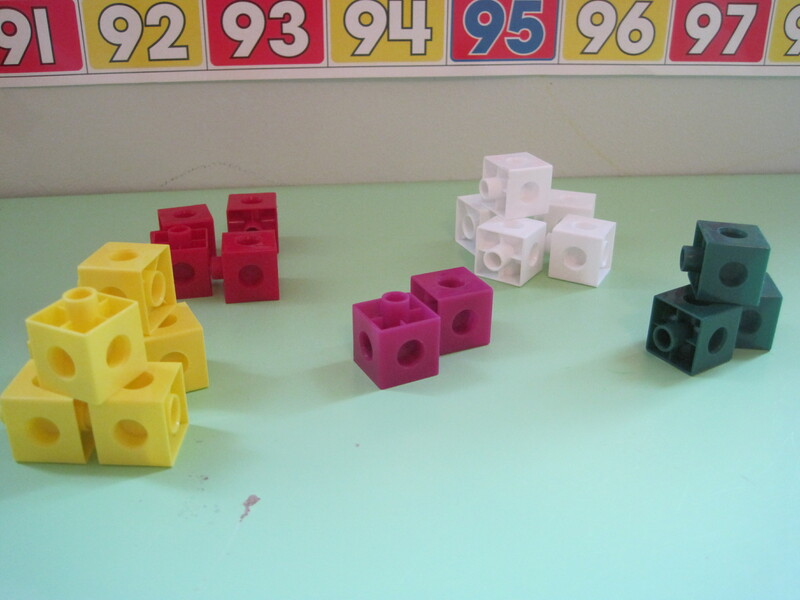 5) They can also compare quantities by organizing the cubes into a row. Who has more? Who has less? Alternate between stacking and clumping cubes into a pile using the SAME quantities. Each numerical picture (stacking v. clumping) tells a different story, even when the quantities do not change. Child learn though this exercise that quantity is constant, even when presented differently. The fact that 5 is more than 3 is an obvious, even to a 2 year old, when the cubes are stacked in a row, but it may not be obvious if the cubes are pulled apart and grouped. 6) A child’s first understanding of addition can come from observing the below image. 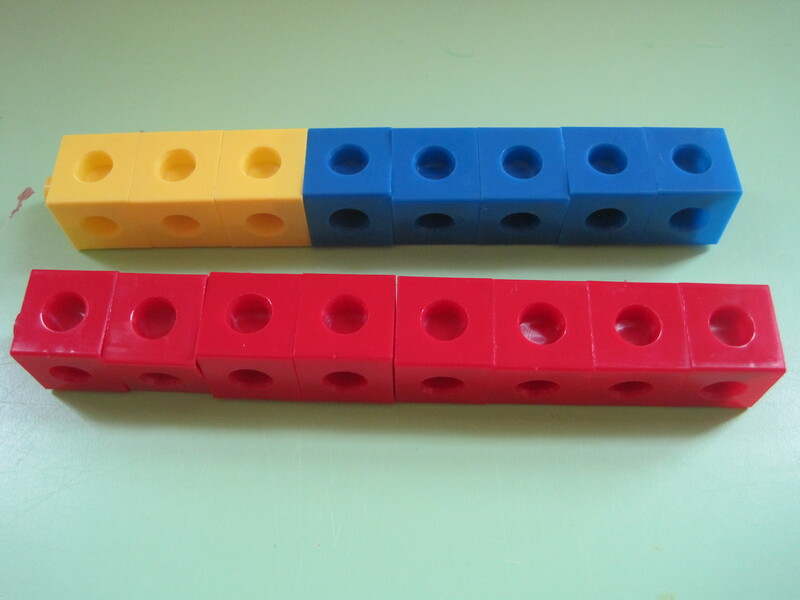 There are 3 yellow and 5 blue stacked together to make one unit of 8. 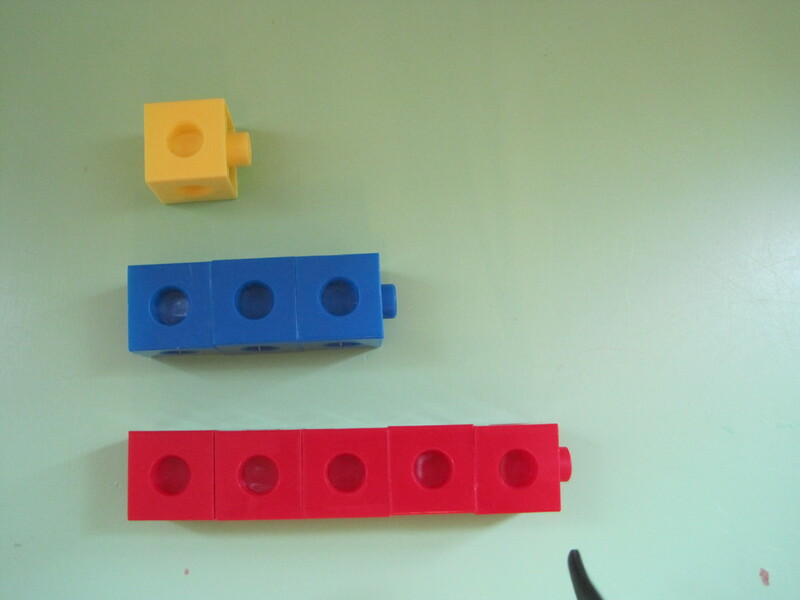 The red row has the same amount of blocks as the yellow and blue row. 5 + 3 = 8! Are there the same amount in each group? How do you know? What’s different about the groups? What is the same? How many are there when you add the yellow and blue? How many reds are there? 7) Adding the same color of cubes can tell a child a different story, although it uses the same addition principle. In this picture, the idea of 10 always equaling 10 is being demonstrated. The orange row is broken into groups of 5 and 5. The green row is broken into groups of 3 and 7. 5 + 5 = 10 and 7 + 3 = 10, so 10 is always the same amount, even when you break it up in different ways. Are there the same amount in each group? How do you know? What is different about each group? What is the same? How many are in each orange group? How many orange total? How many in each green group? How many green total? 8) In this picture, subtraction is being explained. 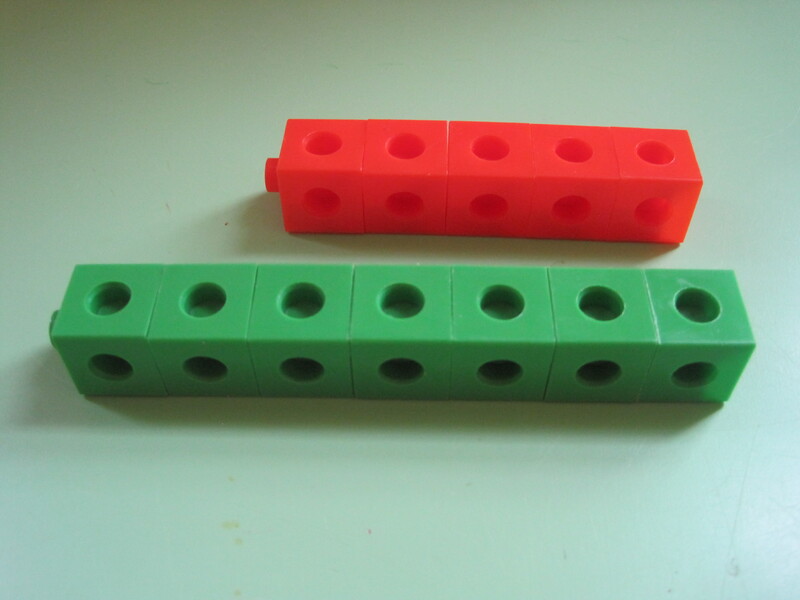 An orange row of 5 cubes is being compared to the green row of 8 cubes. The green row of 8 has 3 more cubes than the orange row of 5. 8 – 5 = 3. How many orange? How many green? What is the difference between the two groups? What is the same about the groups? What is different? 9) After much play, a 4 or 5 year old child may be able to recognize that adding simple equations can be visually represented with the cubes. What do you see in this picture? How many blocks are in each group? Do you see a pattern in the way the groups are being broken up? 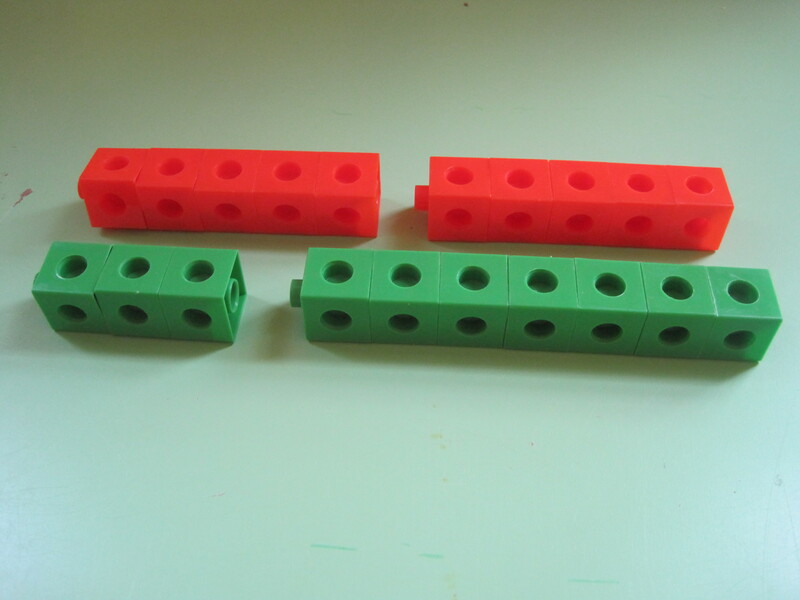 10) This picture is demonstrating how rows can be combined and added to create larger quantities. In this case, multiplication is being shown in it’s most basic form, multiplying 4 x 10, 3 x 10 and then 2 x 10. A 5 year old can explore basic multiplication when looking at this picture and using the number chart. He may recognize the patterns as he compares the cube picture to the written number picture on the chart. How many blocks are in each color group? How many color groups in each clump? How many blocks in each clump? How do you know? Do you see a pattern? Can the chart help you understand the pattern? The possibilities of activities and instruction are limitless with the numerical activity center. Create your own pictures and questions for your child. Even more importantly, savor watching them explore and learn about math as you follow their lead. Unifix & Snap Cubes are available for purchase at The Intelligent Nest Toy Store- Powered by Amazon.com. Hello! I first heard about your blog on Vienna Moms, when you shared it with us. I like this blog post. I was thinking the other day how I can introduce math to my 2 year old. He seems to love numbers and counting. 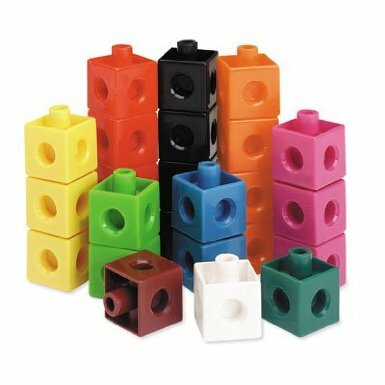 I’m going to look into these snap cubes. Thank you!